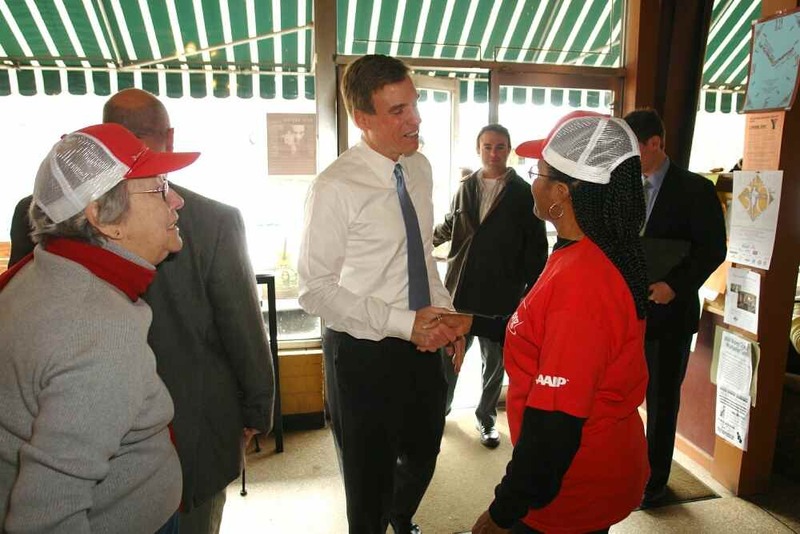 Virginia Senator Mark Warner gets “birddogged” by local activists with AARP. Birddogging is showing up at public appearances of your target and asking him/her to support your petition. Wherever they go, you’re there, putting them on the spot, insisting on a straight answer. Birddogging is a really fun tactic that you can build a team to get involved in. The term “birddogging” in this context is a hunting analogy; the bird-dog barks at birds hiding in trees or bushes and flushes them out where the hunter can get a clear shot. Similarly, this kind of birddogging is all about getting a politician to stop hiding on the issues and force them to either commit or look foolish dodging direct questions from constituents. A good example of effective birddogging was during the 2000 Republican presidential primary when students followed John McCain all over New Hampshire asking him “what’s your plan?” on global warming. Eventually, it became so embarrassing that he had no plan that he had to create one. Another example was 1996 when Bob Dole was memorably birddogged by a man dressed in a cigarette costume named “Mr. Butts” to highlight his support for the cigarette industry. Birddogging is obviously a fairly pressure-oriented tactic and should be reserved for a phase of the campaign when you’re really looking to turn up the heat and are willing to create some friction with the target. Birddogging is a lot more effective if you have a team of people who show up at a member’s public appearances rather than just one or two people. A small group can birddog effectively, but it’s better if you have a team. So therefore it’s smart to start by recruiting a team of 5-10 people or more who are “on call” ready to show up at a birddogging opportunity on short notice. Finding good birddogging opportunities can be challenging. If an election isn’t coming up, your target may not be making very many public appearances. Senators in particular can be hard to get to, especially in very large states. However, if politicians are making public appearances, it’s usually fairly easy to find out. You can start by looking at their website, reading the paper, Googling, or even calling their office directly. The best birddogging opportunities are events where the member will be relatively accessible so that you can approach them directly. Also, it’s great if events are covered by the media so that your confrontation of the member will be noticed by them and hopefully covered in the news. You and your team will want to be as visible as possible at your birddogging event. Often, your target will try to neutralize your birddogging by simply ignoring you, in which case you may need to be so visible that you simply can’t be ignored. It may also help to have a petition or something similar to “deliver” to your target to make your point. Once you are at the event, do everything you can (within reason) to get your target to answer your question about where they stand on the issues. You can get several people to ask him/her directly, hold up signs, get reporters to inquire, etc. The key is to be relentless and highly visible. Also, assign someone to take pictures and/or videotape any interactions so that your target’s comments are recorded. Keep showing up at every public event you can until you get a straight answer.